There is not much information online about LimeVPN so it’s unclear exactly when the company started, but it seems to be relatively young. However, what matters is that it’s a reliable, cost-effective, and user-friendly service with a decent number of servers and good customer support. The company has servers all around the world, including Russia, Singapore, and Japan, so whatever your geographic location, you should be able to find a good server or two near you. LimeVPN advertises itself as “the best global network” with thousands of IP addresses and a terrific customer support system. Keep reading our LimeVPN review to find out more about this VPN provider. 50% savings when you buy today! Signing up and downloading the client is simple and fast and their software is really intuitive and easy to use. The app will configure all your network configurations automatically so everyone could effortlessly use it. When the client opens, you need to select a server and protocol, turn the VPN switch ‘ON’ and you can access websites that are blocked in your country, enjoy absolute anonymity and even increase your Internet speed, depending on the location of the server you choose. As we mentioned earlier in our LimeVPN review, LimeVPN makes it an absolute priority to provide their customers with the best possible speeds. The actual speed you will experience depends on your location and on your Internet service provider (whether they cap the speed or not) but you can rest assured that even with capped speeds and connections to distant servers you will still be able to stream multimedia and play games with no problems at all. The connections are stable and reliable, with little to no interruptions or speed drops. LimeVPN is compatible with all major operating systems, including Mac, Windows, iOS, and Android. The company does not offer apps for Linux-based systems just yet, but Linux users can still use LimeVPN – they just have to configure it manually. Setup is very easy for all the platforms and operating systems and it comes with some of the clearest instruction manuals we’ve seen so far. As far as the number of servers and locations go, LimeVPN is not the strongest provider in the VPN game. It features servers in 19 worldwide locations and 6000 dynamic IP addresses. The service is present in the US, Europe, parts of Asia and Australia. Even though this is definitely not impressive, they claim to have one of the fastest VPN networks in the world. Their speeds really are quite good. As for the security, most standard protocols are covered – you get your OpenVPN, SSL and L2TP, as well as SSTP and even Softether. The encryption is 256-bit, which is definitely nice. The upgraded plan also offers static private IP and a dedicated private VPN node and there is also the NAT Firewall for additional protection. LimeVPN has custom apps for all major platforms and operating systems, including Windows and Mac. No custom software for Android, unfortunately, but Android users, just like Linux users, can still use LimeVPN – they just need to configure it manually, which takes more time and effort. The company writes their own code and manages their own network and servers, which is always a plus since this kind of hands-on approach makes a good service, whatever line of business we are talking about. Customer support is offered to all users 24/7/365. Response times are 15 minutes or below through live chat and several hours through support tickets. There are also plenty of tutorials and how-to videos. LimeVPN allows unlimited switching between regions and servers. Bandwidth and speed are also unlimited. The number of concurrent users depends on your plan and goes between two and 20 or more. Torrenting and P2P are allowed and encouraged, as LimeVPN is actually optimized for P2P. In addition, you can use a special service for USA and UK Netflix, which comes with the best possible speeds for seamless streaming. LimeVPN claims they do not keep any traffic logs on your sessions. Unfortunately, there is no trial period, and the money back guarantee is only 7 days. This is not much, compared to other providers, some of which offer both a free trial and a 30-day money back guarantee period. The support section of LimeVPN website is clearly divided into FAQ, troubleshooting, and direct contact with the support staff. The troubleshooting section is not too extensive, so if you have a question that goes beyond the classic newbie ones, you will probably have to contact the support staff by either filling a contact form with your details, information about the nature of your problem and your operating system, or make use of the pop-up chat window waiting for you at the bottom right of the page. 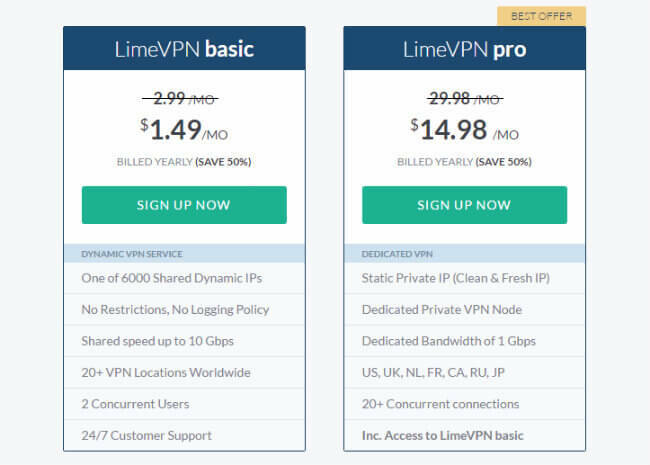 LimeVPN is one of the most cost-friendly VPNs right now. Their monthly basic package is only $2.49 while the yearly one comes out at $1.49 per month, charged yearly. The pro package includes everything the basic one does, plus over 20 concurrent connections, dedicated 1Gbps bandwidth, private VPN node, and static private IP and costs $19.99 per month or $14.98 per month for the yearly plan, charged yearly. LimeVPN accepts all major credit cards plus Amazon gift card, PayPal, Skrill, Western Union, Bank Transfer and, thankfully, BitCoin. 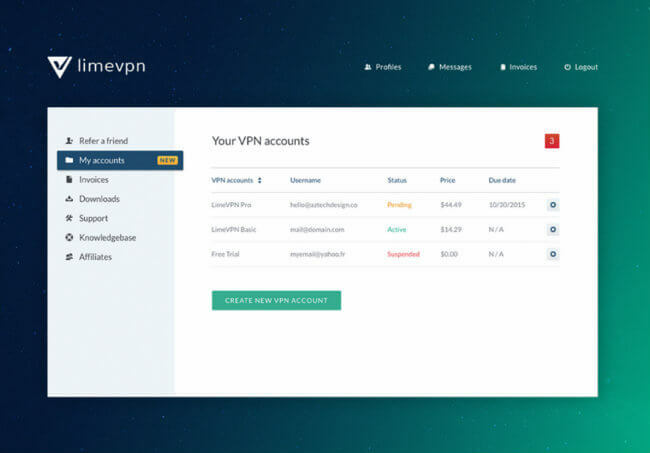 At the end of this LimeVPN review, here’s a quick overview of the features that wowed us and the aspects of the service that could use some improvement. Our ratings are the result of an objective and independent evaluation of LimeVPN, generating the final rating that reflects the overall quality of the company. Ratings may change as the service changes. LimeVPN user rating based on 6 user reviews. I appreciate the ability to choose between different protocols. I don’t just use VPN to stream movies and download stuff, I also want to stay safe and secure so this is important to me. One thing I do not like about Lime VPN is the customer support. The company promises to get back to me within 10 or 15 minutes but one time I had to wait for 45 minutes to get a response. This needs to be fixed. I had some trouble configuring the VPN on my smartphone (android) so I contacted the support. I was pleased with the level of assistance they provided. They didn’t just point me to a tutorial that explains the setup for this kind of device but they were very patient and nice to me. 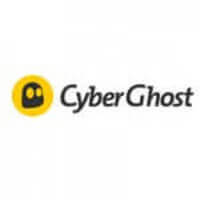 We found 1 verified LimeVPN discount for April, 2019. Sign up and we’ll let you know about future LimeVPN promo codes.